I have had the same color scheme in our bedroom for over five years now. For me, that's an awful long time! (GG syndrom) I desperately want to re-do it or perhaps create a more welcoming environment in the guest room. 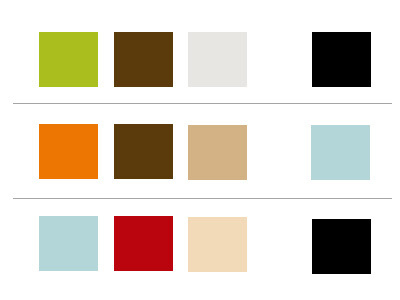 I've come up with my most current favorite color palettes. Now which room and which color(s) to choose.....?? Naturally I like the blue and red combo... ;) I'd definitely do something like that in an office or kitchen. My boyfriend is painting his room a dark brown and mustard color -- it sounds nasty, but it's kind of cool.